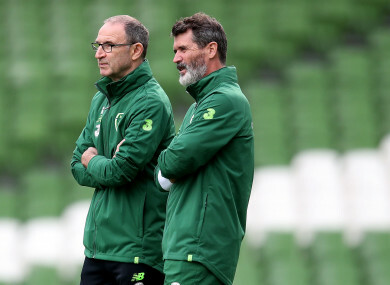 Martin O'Neill, left, and Roy Keane. THE MARTIN O’NEILL era is over. After five years in charge of the Ireland senior football team, the Derry man and his coaching staff have parted company with the FAI as the result of an emergency meeting last night. Having taken over from Giovanni Trapattoni in November 2013, the ex-Celtic and Sunderland boss led the Boys in Green to the Euro 2016 finals with some memorable wins along the way over world champions Germany and Bosnia & Herzegovina. Ireland were knocked out of the European championships at the last-16 stageby hosts France, but unforgettable victories away to Austria and Wales in the following campaign earned them a place in the 2018 World Cup play-offs. However, a heavy defeat at home to Denmark in the second leg last November kicked off 12 months of poor results for O’Neill — ending in a 0-0 draw away to the same nation on Monday night as Ireland were relegated from their Uefa Nations League group. Despite signing a new deal at the beginning of this year, all parties involved have decided to go their separate ways with backroom team Roy Keane, Steve Guppy and Seamus McDonagh also leaving. Steve Walford had already stepped down recently due to personal reasons. “I would like to thank Martin, Roy, and the management team for the impact that they had with the Ireland team,” FAI chief executive John Delaney said. Martin did a great job guiding the team out of a difficult qualifying group – where we beat World champions Germany along the way – to reach Euro 2016 and advance to the last-16 following a historic victory over Italy in Lille. With the Euro 2020 draw taking place in Dublin on Sunday, 2 December, the FAI board will “promptly meet” as they go in search of a replacement ahead of the Euro 2020 qualifying campaign, which begins in March. Email “O'Neill and Keane part company with the FAI 'by mutual agreement'”. Feedback on “O'Neill and Keane part company with the FAI 'by mutual agreement'”.